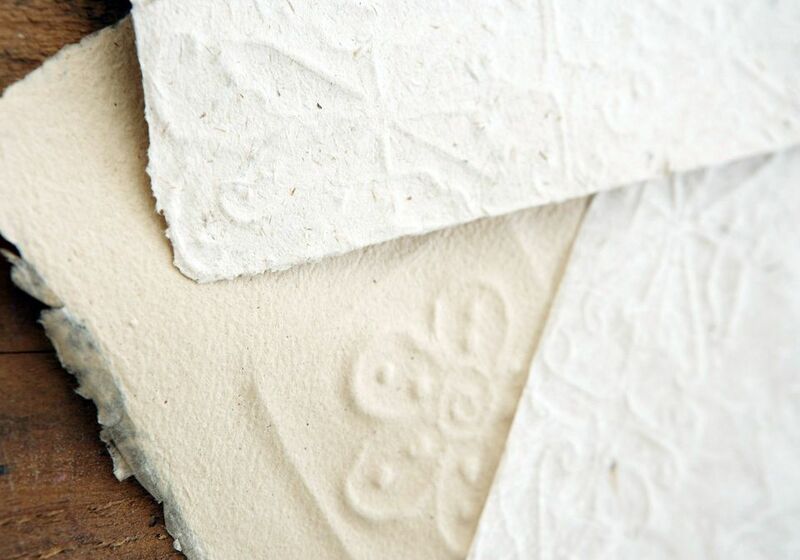 Wet paper embossing or casting is a highly effective technique that is quick and simple to do and is suitable for youngsters as well as adults A rubber stamp is pressed into wet tissue or toilet paper, leaving a raised image. When the paper dries, this subtle image is left and can be incorporated into many projects. Very little in the way of materials are required and although this is a quick technique several hours of drying time are required before the image is ready to be used. Although the finished image is fairly robust, as the paper is highly absorbent care needs to be taken not to wet the paper again. Tear off several sheets of toilet paper and place onto a deep plate or saucer. Wet thoroughly. The amount of sheets required will depend on the desired finished effect. More layers will give a thicker finish and are better for large designs. Start using 6 layers of double thickness toilet paper and experiment with variations. When the paper is thoroughly wet, gently press out any air bubbles as these will spoil the finished image. Take the paper and carefully lay it on top of the stamp. Using a soft dry cloth press the paper down onto the stamp until the image is clear. Gently peel off the paper from the stamp. The wet paper is quite fragile so handle carefully. Lay on a flat surface to dry. When the paper is completely dry, cut the waste paper away and color or use the image as required. Bold, thick lined images work well and are effective with a greater number of sheets. Thin outlines are more delicate and work better with fewer sheets. Very fancy images may not be clear when dry, however as this is a low cost project it is possible to experiment with any number of stamp images. Do not over wet the finished image with paints. Chalks and pencils work well to add color. Try to add color by applying an ink to the stamp before placing the paper. The ink will leach through the wet paper and give a soft color. Use quick drying glue, double sided tape or glue dots to attach the image to other items. This is an excellent project for children. A greater number of layers of toilet paper give a more firm finish and will stand more robust handling. This technique can be varied in a number of ways. Try adding different colored papers to the surface, or sandwich yarns or threads between the paper to give additional texture. Getting a Good Crisp Fold Is Surprisingly Tricky!